More severe weather is in the forecast for much of the nation today. It is peak storm season, but video posted online of this season’s twisters can be deceptive. 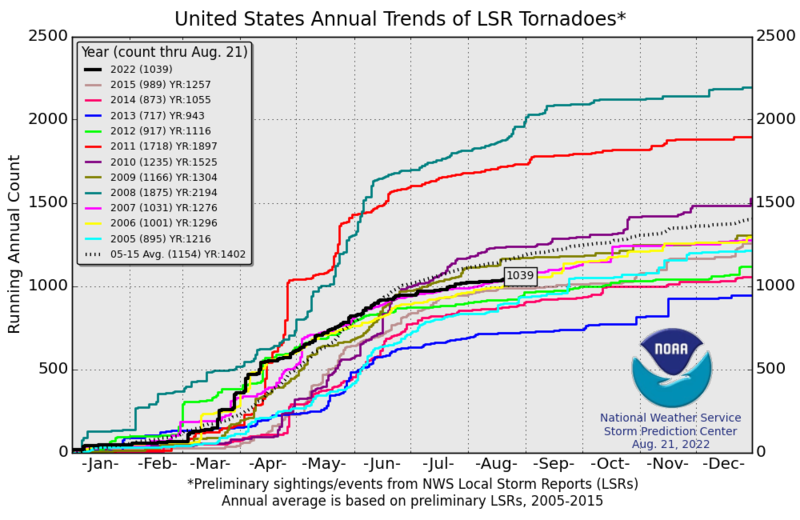 National Weather Service data shows 2016, so far, is below average for tornadoes. As of May 26, there had only been 554 tornadoes across the country, compared to an average of 737. Dr. Patrick Marsh of the NWS’s Storm Prediction Center in Norman, OK says this tornado season reminds him of 2013, the year the massive EF-5 tornado struck Moore, OK.
“Despite the media coverage, there was only one or two tornadoes on most of these days,” Marsh said. The yearly average total of tornadoes is 1,402 according to the NWS.